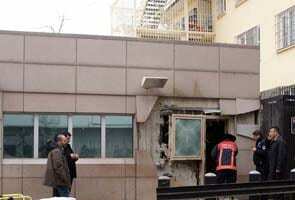 Istanbul: A suicide bomber attacked the US Embassy in the Turkish capital, Ankara, on Friday, detonating himself inside a security entrance to the compound in a blast that officials said killed a Turkish guard and wounded a visiting Turkish journalist. The State Department immediately warned American citizens to avoid U.S. diplomatic missions in Turkey. Alaattin Yusel, the governor of Ankara, told reporters in televised remarks that the explosion took place at a security entrance inside the embassy grounds. He spoke in front of the main embassy building, which apparently was not damaged, as he stood with the U.S. ambassador, Francis J. Ricciardone Jr.
News photographs of the explosion site showed extensive damage to a squat one-story building just inside the compound where visitors are checked by security guards and an X-ray machine. The semiofficial Anatolian News Agency quoted the interior minister, Muammer Guler, as saying the bomber was a known member of an outlawed leftist extremist group. But the precise motive for the attack was unclear. Turkish news media said preliminary investigations by security officials said the bomber might have panicked while going through security controls and detonated a suicide belt prematurely. NTV, a private television broadcaster, said embassy security cameras had shown the assailant entering and panicking as he walked through an X-ray machine. The wounded victim was identified as Didem Tuncay, a former foreign news reporter for NTV, who had been en route to a meeting with Ambassador Ricciardone as the time. Tuncay was taken to Numune Hospital in Ankara, and officials there said that the right side of her face had been hurt in the blast and that she was in serious condition. Turkish-American relations are strong and friendly, but Turkey has not been immune to anti-American attacks in recent years. In 2008, three gunmen attacked security guards outside the U.S. Consulate in Istanbul in a shootout that left the attackers and three police officers dead. After the suicide bombing, the U.S. Embassy posted an emergency message on its website advising U.S. citizens not to visit the embassy or the consulates in Istanbul or Adana until further notice. It also advised Americans traveling or residing in Turkey "to be alert to the potential for violence, to avoide those areas where disturbances have occurred, and to avoid demonstrations and large gatherings." The police in Ankara sealed off the roads around the embassy compound after the blast, witnesses said. "It happened two buildings away from us," said Yunus Emre, a worker at a restaurant frequented by embassy officials. "Our windows shook with a loud sound, and people who worked at the embassy rushed out in panic, running toward the embassy," he said in a telephone interview. "There are already many security officials in the area at all times but police and ambulances came almost immediately after." Fikret Bila, a columnist with Milliyet newspaper, which has offices in the area, said pieces of flesh and tree branches were strewed nearby. The roads around the embassy compound, located on a main thoroughfare in central Ankara, have been under routine police surveillance for several years. The attack came as the Milliyet newspaper reported the arrest of the son-in-law of Osama bin Laden in an Ankara security operation. But Bila said security officials did not believe that there were links between the reported arrest and the attack.